Let’s face it: the gods are a demanding bunch. Despite their immense power and immortal rivalry, Disciples’ four militaristic deities refuse to dirty their hands and resolve their differences themselves. Instead, your armies get to fight and die for their causes. No, it isn’t fair, but it’s fun, and these words of wisdom will help you send the heathen hordes packing. Choosing a leader is literally the first action you’ll take in Disciples, and a particularly important one in the campaign games. Any race can win with any leader, but a good choice can compensate for certain racial weaknesses. The Empire, for example, has mediocre hand-to-hand troops, so picking a warrior as general for your campaign can help counter this as he gains levels and power. The Mountain Clans lack conventional wizards. The Undead Hordes and the Legion of the Damned have excellent fighters and mages alike but cannot heal. The healing boost that warrior leaders offer can help here. With every level they achieve, leaders gain one new ability. Far and away the most critical is leadership, which expands the size of the general’s army by one each time it is acquired. Always choose this when it’s available. The second-best ability is probably pathfinding, which boosts an army’s speed by 25 percent. A pathfinding general can catch and kill enemies that would otherwise remain permanently out of reach (this ability also significantly reduces travel times). Since any leader can only equip two magic items, only one pick (or, at most, two) from artifact lore, arcane knowledge, and banner bearer should be made. Banners, which upgrade every unit in the army a small amount, are a personal favorite, but all three can be useful. The items you have found so far in the campaign should certainly influence this choice. A leader is no better than his army, however, and the four races of Disciples field wildly different forces. Imperial troops are perhaps the most unique. No other race has healers capable of helping other units in battle. This ability means that an Empire force can leave a tough battle in better shape than when it began. Healing also minimizes the number of healing trips to friendly towns that the armies must make and saves a lot of cash. When added to the good healing spells that are available to an Empire force, healers enable Empire armies to travel through more terrain more quickly than any other army can. Early in their development, Empire healers must chose between upgrades that heal one unit a great deal and upgrades that heal every unit a smaller amount. Both choices offer real advantages, but in the final stages of a campaign, where large armies with lots of spell casters are damaging every unit several times in every battle, the group healing choice really comes into its own. The Empire pays for the powers of its healers in several ways. Its only monster unit, the titan, never upgrades and is very weak compared to the monsters of other races. Imperial archers get only one upgrade, and are pretty much worthless when compared to a mage. Finally, their fighter units are fairly easy kills—never field an Empire army without healer support. However, Imperial wizards are fine, and the spells available to the Empire are also excellent, with a great mix of offensive, healing, and defensive magics. Summoning is a touch weak, however. 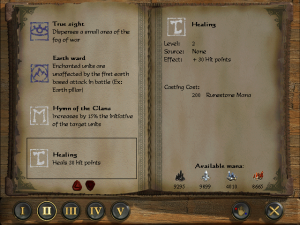 The first Empire summoning spell is second level, and none of the summoned monsters is really outstanding. 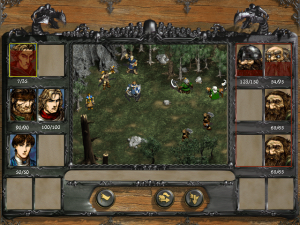 The Mountain Clans initially lack any units capable of affecting an entire enemy army. Their “mages” brew potions that boost the damage of a single unit, which is generally less effective than simply buying another combat unit instead of the mage. However, Clan troops have high hit points and do good damage, enabling them to survive early battles without the firepower of conventional mages. Later upgrades more than make up for the lack of wizards. Fighters, missile troops, and monsters can all be developed into wizard-like units that blast the entire enemy army. And they are tough. With 250 hit points, the Mountaineer is a “wizard” that can stand on the front lines with ease. 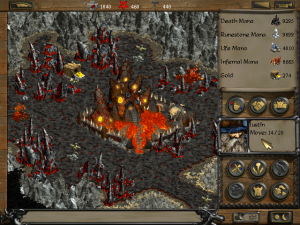 A fully developed Clan army is perhaps the game’s most dangerous, capable of raining mass death from all six positions while absorbing tremendous punishment. Of course, Clan warriors and monsters can also upgrade into very powerful melee units. The Mountain Clans benefit from strong summoning and troop-enhancing spells. They can also cast some limited healing magics. However, they lack high-level direct damage spells. The Clans don’t specialize in blasting the foe from afar. These berserker Viking dwarfs prefer to mix it up at close range. The Undead have few weaknesses. Their melee units are quite good, with high hit points and damage potential. Undead mages are the best around, boasting more hit points and packing a bigger punch than those of any other race. As an added plus, with their life-draining attacks vampires can actually serve as front line troops, healing themselves faster than they are damaged. Undead monsters are also excellent, especially the werewolf, which occupies only one slot. Werewolves are immune to melee damage, and a front rank filled with lycanthropes can devastate many armies, especially low-level Mountain Clan forces. Werewolves aren’t perfect, though. They cost 1000 gold each and have only 100 hit points, which means that mage-oriented forces can destroy them quickly. Use them with care. Undead spells (surprise, surprise) are mainly designed to kill. They have excellent summoning, cursing, and direct damage attacks, few protective spells, and no healing magics. Use them to make fights easier for your armies which, with the exception of vampires, cannot heal and thus will otherwise be making a lot of recuperative trips to town. The Legions of the Damned resemble the Undead Hordes. Like the undead, the Legion has good fighter units. Their mages aren’t quite as strong as those of the undead, but are still very capable. They also have the option to develop fear or paralysis powers (the latter affecting the entire enemy army) that can seriously disrupt enemy strategy. Choosing between the direct damage or paralysis upgrade is perhaps the hardest decision in the game. Be sure to try them both! A definite strength of the Legion is their monsters, which are extremely strong. Legion armies should generally include one demon, whose power is sufficient to compensate for the two slots they occupy. The level 4 demons each have more than 400 hitpoints, and are very, very dangerous. Legion spells, like those of the Undead, concentrate on direct damage and summons. The paralysis spell can buy you needed time to counter enemy threats, and the invisibility spell enables some nasty surprise attacks. The illusions, however, are usually not worth casting. Finally, the Legion lacks healing spells so don’t be shy about using offensive magic to spare your troops costly damage. Disciples places a premium on intelligence. No, not the kind that enables you to ace IQ tests (though that comes in handy too), but intelligence in the military sense, which means knowledge of the enemy’s whereabouts and composition. There are many ways to obtain military intelligence. Thieves can scout enemy stacks and cities, determining their makeup. Certain spells will reveal (or replace, which can be very useful) the fog of war. Still, the best way to scout is with summoned critters. In some scenarios (particularly the fourth one of the Empire campaign), destroying a roadblock stack opens the gate to a horde of enemy armies that were awaiting just such an event. By scouting the far side of every roadblock with summoned monsters, you can identify these traps in advance. Additional summoned beasts and direct damage spells can take out the weaker stacks while you recruit enough throwaway armies to handle the problem. Disciples campaigns enable you to carry one hero forward to subsequent scenarios. It therefore makes sense to let that one hero do the bulk of your fighting, so that experience accumulates where it will do the most good. However, later scenarios are too large for a single hero to deal with all the threats that present themselves. A second fighting hero, designed to explore and take out minor enemies, should also be cultivated. Don’t waste time and experience on rod-planters, though. Their low leadership scores mean that they should avoid fights, not seek them out. Be certain that any permanent powerups are given to the hero moving to the next scenario, and visit every available shop and ruin, before completing your objectives, to find useful items. One productive (though ruthless) tactic is to betray any allies you might have just before the end. 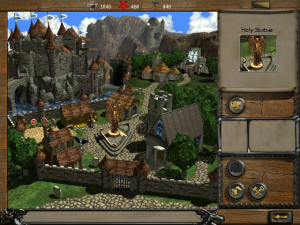 By slaughtering their heroes, you ensure that you can pick from every item a scenario offers. And if you start to feel guilty, remember, they don’t follow the one true religion—yours.